Greetings from the Pacific NorthWest, USA. Orcas Island to be exact which is located midway between Seattle, Vancouver, and Victoria to our West. Please know that we are an intentionally small, build-to-order shop that enjoys working closely with our customers. We take great pride in crafting and supporting the installation of our stoves for fine projects around the globe. We maintain a first come, first served "build list", and have a yearly output of about 100 stoves. Quality over quantity and all that jazz, etc.. In the past, iron foundries were common place and most big cities had one. If a stove building venture were lucky, there would also be a porcelain enamel shop nearby. Times have changed and the current climate is very different. In order to source the best available iron/bronze castings, porcelain enamel, and sheet metal items, we procure our components from various sources in the USA & Europe. Getting that flow of parts and pieces to arrive on time is a full time job which we constantly work to streamline. A stove's parts will have traveled thousands of miles before they are hand fitted here at our island workshop. So as to be able to make progress on your install while your bespoke stove is in the queue to be built, we suggest getting your support platform, heat shielding, and roof/deck pipe parts installed ahead of time. Using the footprint measurements found on this website's drawings page, you can lay out your stove location, then project up with a plumb line to figure your roof/deck pipe penetration. Overhead obstructions (deck beams/roof joists) are not a problem and can be avoided by using an adjustable elbow or two. Normally we have smoke heads, bronze deck irons & residential insulated pipe parts ready to ship at time of order so you can get started. Having assisted scores of folks with planning their installs on land and sea, I'm sure I can invision your particular application and can inspire the confidence for you to get the bulk of the work done in advance. 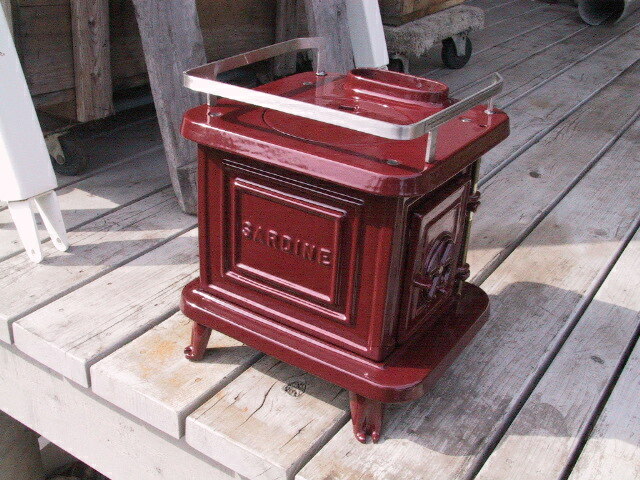 The stoves are commonly shipped worldwide and UPS has done a good job of delivering SARDINE / COD / HERRING to overseas destinations. HALIBUT ships via air or sea freight. Domestic orders are handled through UPS/Post Office/Common Carrier.